Sprucing up your deck, patio, or yard just got an inspirational boost, thanks to these projects you can do yourself. 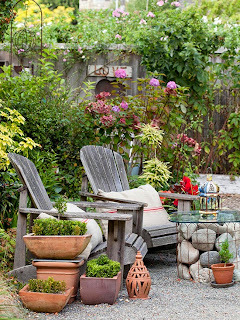 They range from small and simple to more intricate and involved, and all are worthwhile to make the outdoors more livable and lively come spring. 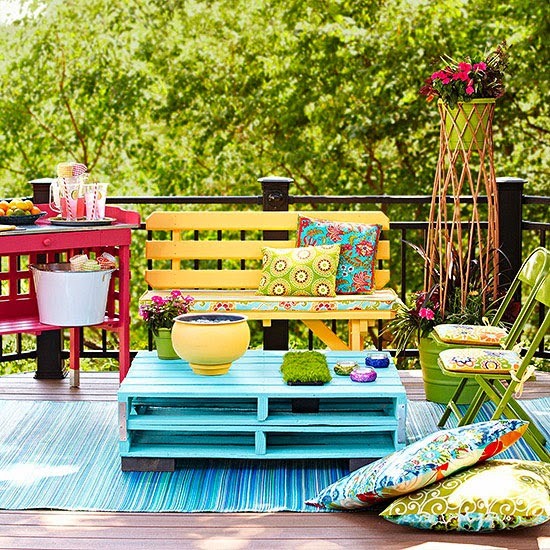 Wooden pallets are easy to come by on the cheap -- many businesses will even give them away! They are the building blocks of a coffee table so low-maintenance, it can stay outside year-round. Our version stacks two pallets together for height and features a window box-style planter (which we filled with Scotch moss) as a centerpiece. 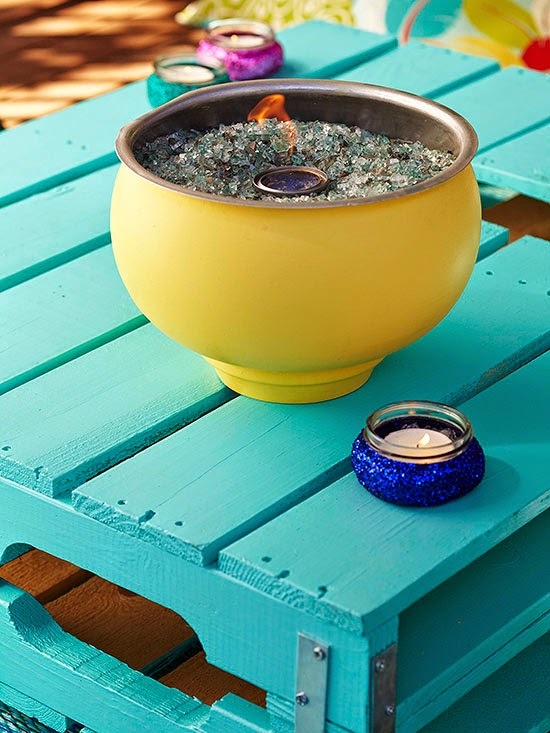 Conjure up a festive mood with this outdoor fire bowl. 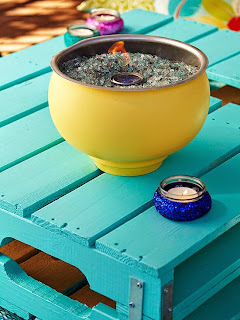 Start with a fireproof container, such as this galvanized bowl that we primed and coated with outdoor paint in a cheery hue. Fill the bowl with recycled tempered glass chips, and tuck in a can of alcohol-free gel fuel. With a click of a lighter, the flame will dance and enchant for hours. 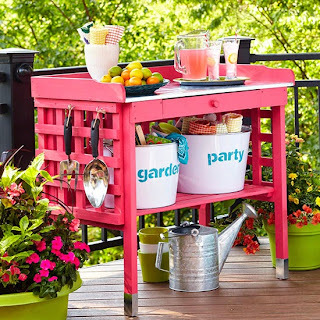 Boost the function of a store-bought potting bench, which doubles as an outdoor serving station. Cut sections of lattice to fit the sides and back, paint them to match and fasten the lattice with screws. Use S-hooks or screw eyes to hang garden tools, gloves, buckets, or other necessities so they’re always within reach. 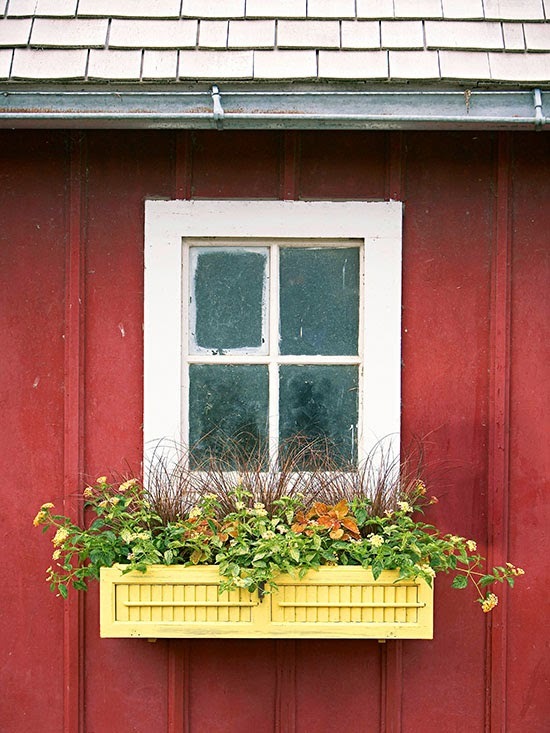 A salvaged shutter perks up an otherwise plain window box almost as easily as flicking open the louvers will light up a room. 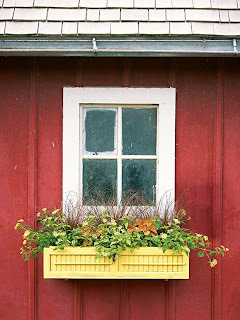 Find a shutter about the same size as the front of the box, and paint it if you'd like. (We coated ours with a sunny yellow shade.) Once it's dry, use screws to attach it to the box. Create an outdoor cocktail table both rustic and glamorous with just a few supplies. Five feet of heavy-duty metal hairpin fencing forms a wire cylinder, and we used additional wire and pliers to secure the cylinder shape. (Clip the bottom to a finished edge so there are no jagged spots.) 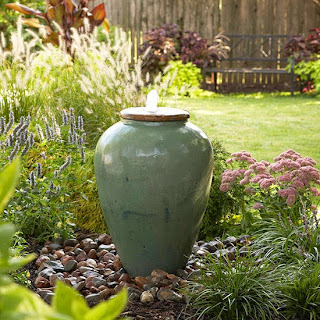 Set the cylinder near a cozy seating arrangement and fill the wire frame with 30 to 40 river rocks, arranging them so that flat stones sit flush to the interior walls of the cylinder and so that the top tier of stones sits below the top edge. That way, a tempered glass tabletop can crown the whole assembly. All fences are functional -- even the simplest ones are good at delineating the neighbor's yard from your own -- but this one takes practicality to new heights. Not only are the boards brushed with green, blue, and gray exterior wood stain for a lively striped look, but the fence also holds aloft a couple of gutter gardens. 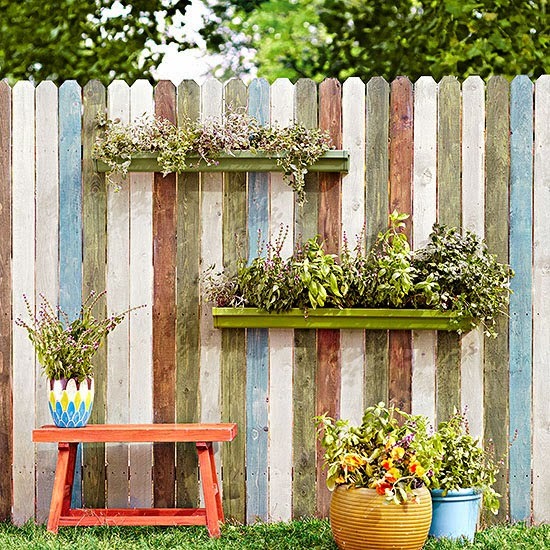 That's right: Inexpensive vinyl gutters -- the ideal shallow plant container -- were cut into 3-foot sections (folks at the hardware store can do it for you) and then sprayed with two shades of green paint. Once we attached the gutters to the reinforced areas of the fence, we filled them with potting soil and plants for an easy, almost-instant garden. 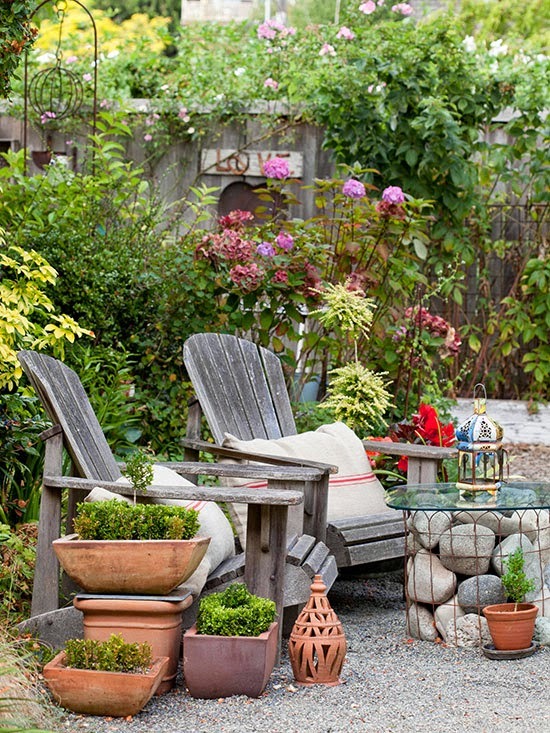 What's more refreshing in a backyard than the playful babbling of a fountain? Even more appealing, a water feature will drown out street noise and welcome birds and butterflies into a garden. You may need to track down some of the supplies from a water-garden shop or online, but such an eye-catching -- and ear-delighting -- feature is well worth the effort.